Fellow extremists quickly condemned Tehreek-i-Taliban Pakistan (TTP) for their brazen attack on Pakistani school children. The attack began the morning of December 16th as seven armed TTP gunmen entered the Army Public School and Degree College in Peshawar. They killed 148 during the eight-hour siege, including 132 children. All of the attackers died, either by detonating their suicide vests or during the fighting with Pakistani commandos. Shortly after the attack, the Afghan Taliban called the actions un-Islamic and expressed their sympathies to the grieving families. The regional al Qaeda affiliate wrote of “hearts bursting with pain and grief” over the incident. The noteworthy criticism from the Afghan Taliban raises the question: why would TTP specifically target children and risk pushing their allies away? TTP and the Afghan Taliban both align themselves under Mullah Omar. The TTP’s top commander, Mullah Fazlullah, fought in Afghanistan during the early 2000s and reportedly had quite favorable relations with the Afghan Taliban. Additionally, Mullah Fazlullah, as both cleric and scholar, enjoyed the respect of many fellow jihadists. Much less is known about the regional TTP commander, Umar Mansoor (aka Umar Adizai), who apparently planned the attack. He is thought to be in his mid-30s and a father of three. According to the scant reports, he attended school in Islamabad before later entering a madrassa. So, why might TTP have targeted the children and risked alienating allies? Did the subordinate commander, Umar Mansoor, go rogue and disobey Fazlullah or, perhaps, fail to share his plans with the TTP leader? While there is little reported on the relationship between Umar Mansoor and Fazlullah, what exists suggests their relationship is close. If those reports are true, it becomes more difficult to accept that Umar Mansoor acted on his own. Was the attack related to the infighting within TTP? Somewhat, perhaps. In 2013, Mullah Fazlullah took command of TTP. His assumption represented a significant shift in TTP leadership from that of the previous seven years, as he was neither a member of the Mehsud or Wazir tribes nor a resident of the Federally Administered Tribal Areas. Earlier this year, the factiousness bubbled over and the Mehsud tribe formally broke with TTP. However, it is hard to see how Fazlullah would benefit from the attack. No doubt he was familiar with Mullah Omar’s previous admonitions to be discriminant in selecting targets and the application of force. Perhaps, though, the stress within TTP resulted in the horrific, and seemingly counterproductive decision. The most likely reason, though, may just be the one given by TTP: an attack to avenge their losses, both adults and children, from sustained Pakistani military operations in the tribal areas home to many of them. Perhaps Pakistan has finally gotten serious about fighting the Taliban and other insurgent groups. When my team and I were in southern Afghanistan in 2010, Afghan government officials and village elders alike routinely criticized Pakistan and their security service for actively supporting the Taliban. Questions have long remained regarding the Pakistani government’s resolve to fight the Taliban, with many suggesting they secretly helped “good” Taliban fighting in Afghanistan, while providing an air of commitment in fighting the “bad” Taliban who conduct attacks in Pakistan. The TTP with approximately 900 attacks over the past seven years would seem to fit the bill of “bad” Taliban. Time will tell, but perhaps Pakistan’s latest military offensive is really having an impact on the TTP. If so, the TTP may have targeted the children to both avenge their own losses and to show, in a distorted and tragic way, that their strength remains. 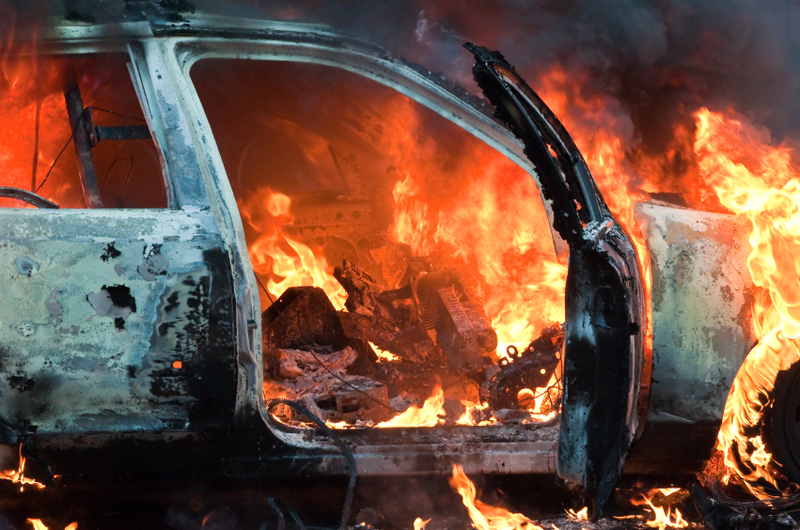 An estimated 61% more people perished from terrorist attacks in 2013 than did in 2012. As the Global Terrorism Index Report authors note, those 18,000 deaths far surpassed the 3,361 deaths from terrorist attacks in 2000. Drawing on data from the National Consortium for the Study of Terrorism and Responses to Terrorism’s Global Terrorism Database, the report and the data it contains have much to offer. 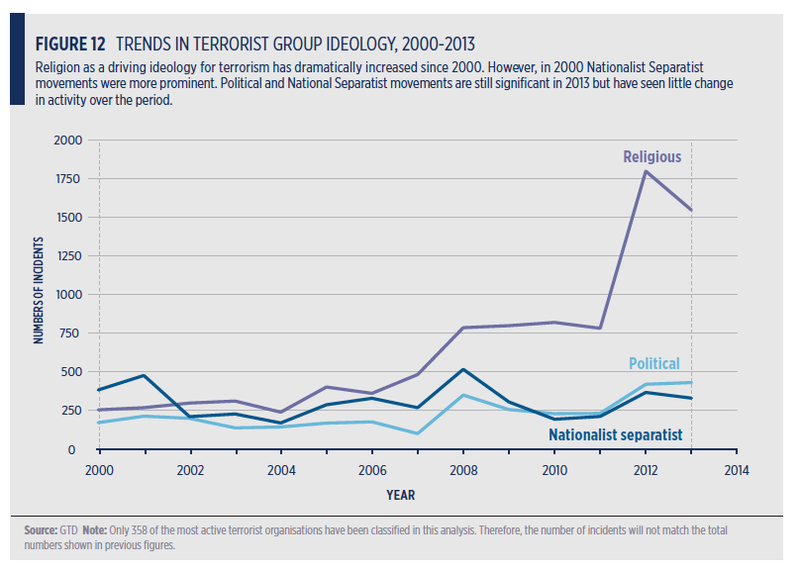 Interested in how terrorist group ideology has morphed over the past decade and a half? Check out the following graphic and observe how the religious-based groups have come to dominate terrorist activity. Who conducted the attacks? Two-thirds of the fatalities were caused by four groups: the Islamic State, Boko Haram, the Taliban, and al-Qaeda and its affiliates. As the report noted, “extreme interpretations of Wahhabi Islam” were the key commonality among the groups. Unsurprisingly, more than 50% of the fatalities occurred in Iraq and Afghanistan. Pakistan, Nigeria and Syria accounted for another 30% of the fatalities. In total, those five countries bore the brunt for 82% of terrorist-caused fatalities last year. Looking at the details of the attacks, half of them resulted in no fatalities. Approximately 40% killed between one and five people, while 10% took the lives of six or more human beings. The most lethal form of attack was suicide bomber. While suicide attacks had the highest failure rate (56%), they caused an average of 11 fatalities per attack as compared to two fatalities for all other forms of terrorist attack. Last year, suicide attacks only accounted for five percent of all terrorist attacks. Of concern, though, the Islamic State conducted 58 of the suicide attacks. By comparison, the two most prolific suicide attack groups over the past decade—al-Qaeda in Iraq and Tehrik-I-Taliban in Pakistan—have averaged 13 and 14 suicide attacks per year, respectively. As a final note—perhaps for balance, perhaps to recognize the role of fear in terrorism—how might we understand the tragic loss of 18,000 lives to terrorism last year as compared to the 430,000 who were killed in homicides? The authors of the report note that the manner of data collection for the Global Terrorism Database became more automated in 2011. As a result, some events that may have been missed in prior years would now be collected, possibly inflating numbers for 2011 and following years. In response, they modeled three approaches. For example, their conservative model indicated the number of terrorist events rose by 475% since 2000, as compared to a 689% increase for the upper bounded model. With so many stories being dedicated to Ebola, I was absolutely delighted to see coverage of influenza this week. We’ve also got stories about the proliferation of antibiotic resistant bugs in nursing homes, George Washington as the first father of vaccination, and of course, an Ebola update. There will be no news round up next week, so I will see you all back here on October 25. Enjoy your weeks and don’t forget your flu shot! With the coverage of the Ebola outbreak in media (and even on this blog) it may have inadvertently caused unreasonable panic in the American populace. The fact of the matter is one person in the U.S. has died from Ebola. Every year, according to the CDC, more than “226,000 Americans are hospitalized with flu and approximately 36,000 die from flu-related complications.” News outlets this week quietly reported on flu vs. Ebola and offered points of clarification about both diseases as well as tips for staying well. These include getting your flu vaccination, washing hands frequently especially after using the restroom and before eating or preparing food, and avoiding touching eyes, nose, or mouth to limit spread of germs. This week, the Daily Beast provided an excerpt from historian Tom Shachtman’s new book, Gentlemen Scientists and Revolutionaries: The Founding Fathers in the Age of Enlightenment. At a time where people are choosing to forgo vaccinations and alarm over Ebola grows worldwide, it is amazing to see George Washington—Virginian, 1st President, Founding Father, serious boss, and old fashioned speller—decide that army immunization would not only save the lives of soldiers, but indirectly safeguard a young American nation. Shachtman recounts a February 1777 letter from Washington to John Hancock, President of the Continental Congress. The first (and only) patient with a domestically diagnosed case of Ebola died this week in Dallas, TX amid calls, and responses, about tightening airport screening and travel restrictions. Six major American international airports have enhanced screening for travellers arriving from West Africa while airline workers at LaGuardia have protested over what they say are inadequate protections from potential Ebola exposure. In other air travel related news, a passenger was removed from a US Airways flight after joking about being infected with Ebola and a sick passenger traveling from West Africa to Newark airport does not have Ebola. A nurse in Spain did get infected with the virus this week, as other European nations fear further spread inside their countries. American Ebola survivor Dr. Rick Sacra was hospitalized and treated this week for pneumonia and another American Ebola survivor, Dr. Kent Brantly donated his blood in order to help treat an infected NBC cameraman. Evidently one fifth of Americans, according to a Gallup poll, are concerned about getting Ebola which is causing the ‘apocalypse business’ to boom. Meanwhile, West Africans living in the U.S. are taking action to spread information within their communities about the virus and there was a wonderful piece on how Nigeria beat Ebola. Finally, CDC director Dr. Tom Frieden spoke this week on how this Ebola outbreak is like the AIDS epidemic and why he doesn’t support a travel ban to combat the outbreak. All of this comes at a point in time where the number of deaths from the outbreak has reached over 4000. Yoshihiro Kawaoka was recognized as a 2014 Popular Mechanics Breakthrough Award recipient for his work on pandemic influenza. You may remember Kawaoka and Ron Fouchier for their controversial work on H5N1 transmission in ferrets from 2011. Fouchier, also, had an interview this week discussing influenza research. Is the U.S. responsible for the resurgence of polio in Pakistan? Some blame the CIA’s use of fake polio immunization campaign to find Osama Bin Laden as a reason some are wary of being vaccinated. Were you born between 1945 and 1965? You may have hepatitis C and not even know it. The CDC recommends a routine blood screening for those in this age group. Where is Kim Jong-Un? And what does that mean for North Korean WMD? One of my favorite days of the year is next week…it’s Global Handwashing Day! Mark your Calendar for October 15 and visit the website for tools and planning guides. I have to offer my apologies and my thanks. Please let me apologize for the lack of Pandora Report and the light coverage on the blog over these past two weeks. The month of June was absolutely insane between work and summer courses. Fortunately, all that craziness is finally over, so let me thank you most sincerely for your patience and understanding. With this special July 4th edition of Pandora Report, please consider things around here back to normal. Now, onto the news! Highlights include Syrian chemical weapon disarmament, the arrival of Chikungunya to the U.S., an anthrax incident at the CDC, an Etihad Airlines based polio campaign, and Ebola devastation in West Africa. Earlier this week, the Pentagon reported that the transfer of Syrian chemical weapons, from a Danish cargo ship to the U.S. vessel that will neutralize and destroy the weapons, is complete. The weapons and associated materials were transferred to the Cape Ray, which will travel from Italy into international waters where the weapons will be dismantled and neutralized. The Pentagon press secretary Rear Admiral John Kirby reported that the process should take several weeks to complete. Business Standard—“‘By showing this engaging story on board our flights, Etihad Airways is supporting the efforts of the UAE in helping to eradicate polio in Pakistan,” said James Hogan, President and Chief Executive Officer of Etihad Airways. According to the Centers for Disease Control and Prevention, sometime between June 6 and 13, up to 84 lab employees at the headquarters in Altanta, were possibly exposed to anthrax. The possible exposure, which was caused by technicians not following laboratory protocol, resulted not only in employees taking powerful antibiotics as prophylactics but also in the reassignment of the head of the Bioterror Rapid Response and Advanced Technology Laboratory, Michael Farrell, while the incident is investigated. Chikungunya, a viral disease spread by the same mosquitos that spread Dengue fever, has made its way to the Americas. Fortunately, the type of mosquito that spreads the viruse, the Aedes aegypti, is not native to the United States. However, its close breed “cousin” Aedes albo, lives as far north as Chicago and is believed to be able to spread Chikungunya. From the Pandora Report and all of us at the George Mason Biodefense program, we wish you a happy and safe Independence Day!! Highlights include the CIA and their “Immunization Campaigns,” Ricin Sentencing, Dengue Warning for the World Cup, and Bacteria and E-Cigarettes. Have a safe and wonderful Memorial Day weekend!! Shakil Afridi, a Pakistani doctor, provided polio vaccinations in the city of Abbottabad as a cover for the CIA-backed effort to obtain DNA samples from children at a compound where Osama bin Laden was later found and killed in 2011. This week, however, the White House assured the deans of prominent U.S. Public Health Schools that the CIA will no longer use vaccination programs as a cover for spy operations. The agency also agreed not to use genetic materials obtained through such programs. This announcement comes at a time when Polio cases are growing and spreading in Pakistan—in 2013 cases in Pakistan accounted for more than 20% of all new polio cases worldwide. This week, James Dutschke was sentenced to 25 years in prison for developing and possessing Ricin. Dutschke mailed the ricin-laced letters to the President, U.S. Senator Roger Wicker, and a Lee County Mississippi Judge. This topic has been circulating for weeks, if not months, but with the beginning of the World Cup a few weeks away, this story has been popping up in the news on a daily basis. Of the 12 World Cup host cities, the risk of Dengue fever has prompted a high alert in three—Natal, Fortaleza, and Recife—and an increased risk in four—Rio, Belo Horizonte, Salvador, and Manaus. Dengue fever, sometimes called “breakbone fever,” is a viral infection transmitted by the Aedes aegypti mosquito. It can range from a mild, flu-like illness to a potentially deadly one, which occurs in approximately 5% of patients. There are no vaccines or effective treatments for Dengue Fever. Brazil has had more cases of the disease than anywhere in the world—more than seven million infections between 2000 and 2013. Many, including everyone’s favorite anti-vaxxer Jenny McCarthy, claim that e-cigs are safer for their health than traditional cigarettes. However, it addition to the harm cigarettes inflict on the immune cell, it turns out that either type of cigarette may be just as bad for the body’s natural bacteria. In what has to be one of the strangest public health strategies to date, health officials in the Punjab districts of Pakistan have released over a million Tilapia into pools, ponds, large puddles – just about any body of standing water – in an effort to combat dengue. Pakistan has a long rainy season which creates thousands of pools of water where the mosquitoes who carry dengue lay their eggs. By releasing the fish into these pools, the larvae are eaten before they can hatch, killing the virus’ vector and preventing its spread. While it may be tempting to dismiss the strategy as a bizarre version of the woman-who-swallowed-the-fly nursery rhyme, don’t – apparently, it’s working. In 2011, the Punjab districts had over 20,000 cases of dengue, including 300 fatalities. So far this year, following the release of over 1.6 million fish, there have been just 100 cases total. The question of what happens to the fish when the pools evaporate has not yet been addressed, but we’re still impressed – can you imagine having to pitch this idea to your superiors? Read more about this very innovative use of fish at the Guardian.